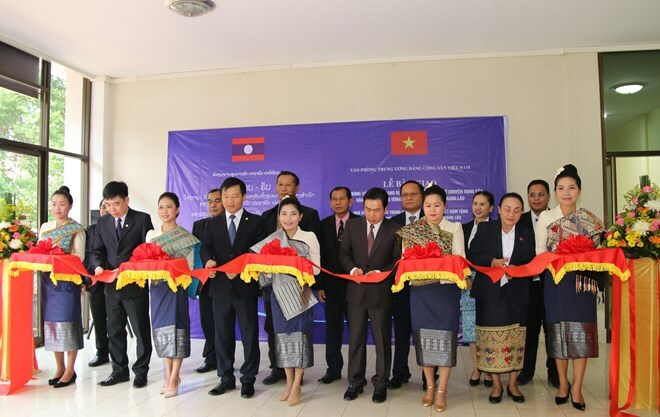 Vientiane (VNA) – The Office of the Communist Party of Vietnam (CPV) Central Committee handed over an upgraded specialised archive to the Office of the Lao People’s Revolutionary Party (LPRP) Central Committee at a ceremony in Vientiane on March 28. The upgraded facility is equipped with a compact shelving system, specialised document containers, temperature and humidity control equipment, an air conditioning system, a lighting system, and a standard fire safety control system. Deputy Chief of the CPV Central Committee Office Bui Van Thach said the archive project demonstrates the bond between the two offices on the basis of the great friendship, special solidarity and comprehensive cooperation between the two Parties, States and peoples. He expressed his belief that with the new modern facility, the LPRP Central Committee Office will obtain more achievements in archival activities. For his part, Deputy Chief of the LPRP Central Committee Office Khampha Phimmasone said the assistance from the Vietnamese side not only helps with his office’s storage of documents but also supports the two countries’ solidarity and friendship.